It’s the era of peace and love in the 1960s, but nothing is peaceful in Caroline’s life. Since her beautiful older sister disappeared, fifteen-year-old Caroline might as well have disappeared too. She’s invisible to her parents, who can’t stop blaming each other. The police keep following up on leads even Caroline knows are foolish. The only one who seems to care about her is Tony, her sister’s older boyfriend, who soothes Caroline’s desperate heart every time he turns his magical blue eyes on her. Tony is convinced that the answer to Jess’s disappearance is in California, the land of endless summer, among the runaways and flower children. Come with me, Tony says to Caroline, and we’ll find her together. Tony is so loving, and all he cares about is bringing Jess home. And so Caroline follows, and closes a door behind her that may never open again, in a heartfelt thriller that never lets up. I wish that I didn't read a little spoiler about the book. (Avoid this entire review and the synopsis if you don't want to know that spoiler. Just jump straight into the book.) If I didn't know the book is going to have a very huge turn into implied horror town, then I would probably be reading along with bliss. At least, that is until the terrible parts smack right into my face. Caroline, after her sister has been declared missing by the local authorities, begins to wonder where Jessica has went. She teams up with Tony's ex-boyfriend and believes that Jessica is still alive in California. She slowly changes into a much different girl as the story goes on, and she even kisses Tony (sister's boyfriend) while searching for a way to get to California. But all takes a very, very dark turn once a body of a young woman has been found in the desert. 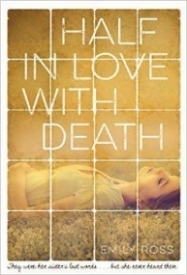 The plot goes by very fast, and HALF IN LOVE WITH DEATH is actually a short book to read. It's enjoyable, and though there are some lapses here and there, the book is put together well. The mystery of Jess is definitely one compelling story. Caroline may not believe that something bad has happened to Jess, but we, as the readers, would definitely notice the signs and see what's going on with the handsome villain. The villain is definitely disturbing, and his traits are subtle in nature. The few people who knows the inkling of the truth are written off as crazy by the narrator and every other character (except for the villain and the authorities, of course). His scenes may originally come off as charming, but as the story marches on, he becomes a much more creepy character. Think "bad boy" turned "stalker with a crush" turned "serial killer with a few deaths under his belt." And the ending. My. It's chilling. Overall, HALF IN LOVE WITH DEATH is a happy... Oh, wait. It isn't. It's a seemingly pretty story with a dark history and plot. It's disturbing, and it's not for those looking for a light romance with sunshine and unicorns. The villain is a great character, and he's so subtly evil that I wish Caroline has less scenes with him. Entertaining story/mystery. As if moving to a different state wasn't bad enough, Caroline's older sister Jess is missing. She's run away before but Caroline can't help but think this time is different. No one, including her parents, take Caroline's concerns that Jess might have runaway to California seriously. The only one who does is Jess's boyfriend Tony. Problem is everyone warns her to stay away from him as he's trouble. Caroline finds herself swayed by the seductive charisma of Tony even when her gut tells her he's lying. What worked: The 60s setting is a great backdrop for this psychological thriller. The Arizona desert plays a part in the mood of this story too. The stark desert and the heat boil to a frightening conclusion that forces Caroline to confront her biggest fear. Caroline loves the Beatles and wants to have a boyfriend. She has been crushing on hot Tony and has entertained fantasies of him. When he starts to give her attention? Caroline loves it even when there are subtle and not too subtle clues that her parents and others might be right to not trust him. Tony is very charismatic and knows how to get girls and others to follow him. There is one scene, where he tells Caroline he can dye her hair blonde, that is very creepy. His girl 'friends' all give off an almost-Manson like vibe. All think that Tony loves them and that they're the special one. I liked how Ross drops subtle hints throughout the novel that not all is what it seems with Tony. What fifteen-year-old girl wouldn't love the attention of a very hot guy? Rumors fly around in this small knit town. It's hard to believe who is telling the truth right down to some of the frenemies who don't seem to really be there for her. In one case it's more a case of the whole 'don't date a former boyfriend of a friend' scenario. Billy is a guy more Caroline's age that she secretly likes but after he kisses her? He ends up going back to her friend May. I do think this is the catapult that has Caroline give in to Tony's charm and disregard everyone else's concerns. I did want to know more about Jess and was a little disappointed at the conclusion. No, I won't reveal more as that would be a spoiler though I do admit, the final reveal is chilling. Mesmerizing coming of age psychological thriller where readers wonder what is real and what is a lie.